Fructose or fruit sugar is a simple sugar (monosaccharide) found in fruits, certain root vegetables, some flowers and honey. It can be directly absorbed into the bloodstream as is the case with glucose, another widely available simple sugar, without it having been broken down any further by digestive enzymes in the gut. Sometimes fructose is not well tolerated in the gut and therefore not absorbed. It can arise with various diseases of the gut where different types of nutrients may act as irritants. With intolerance and malabsorption of other nutrients, it is often the deficiency or defect of the digestive enzymes that break it down which is the cause of the problem. The undigested nutrients cannot be absorbed. However, fructose does not need to be broken down further in the gut. Instead it is a problem with fructose transport and cleavage within the liver that is the main problem. Problem with the compound responsible for transporting fructose, known as GLUT-5, leads to fructose malabsorption. If the breakdown of fructose by the liver is impaired then it leads to fructose intolerance. Since it is a familial problem, it is more correctly known as hereditary fructose intolerance (HFI). What is fructose enzyme deficiency? Fructose enzyme deficiency is a problem with the metabolism of fructose also known as fructose 1-phosphate aldolase deficiency. It is gives rise to a condition known as hereditary fructose intolerance. The breakdown of fructose in the liver occurs in several steps. 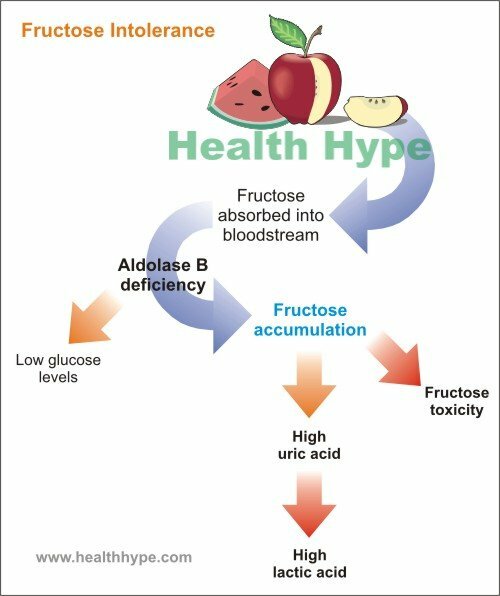 Aldolase isozymes and particularly aldolase B is the cause of the problem in hereditary fructose intolerance (HFI). Isozymes are a group of enzymes that are structurally similar but have different functions. With regards to aldolase there is aldolase A, B and C. It is aldolase B that is responsible for three steps in fructose metabolism. The enzyme is also present in the kidneys and intestine although the main site of fructose cleavage is within the liver. Reduced cleavage of fructose 1-phosphate by aldolase also inhibits another enzyme known as fructokinase. This leads to an accumulation of free fructose in the liver, kidneys and bloodstream. By impacting on other cellular reactions, the high fructose levels cause an increase in uric acid levels within the blood (hyperuricemia). The kidneys attempt to excrete the excess uric acid and this compromises lactic acid excretion. There is a build up of lactic acid in the blood above the normal levels – lactic acidemia. Normal glucose regulation is also impaired since aldolase B plays a role in the production of glucose from other nutrients (process known as gluconeogenesis). Therefore hypoglycemia (low glucose levels in the blood) is also present in hereditary fructose intolerance (HFI). Fructose 1-phodphate aldolase deficiency and therefore hereditary fructose intolerance (HFI) is a genetic abnormality. It is passed on as an autosomal recessive trait meaning that the genetic abnormality needs to passed on from both parents. It was initially thought of to be a very rare genetic disorder but it appears that it is more common and affects about 1 in 20,000 people. There is no predilection for gender meaning that it affects males and females equally. The condition may only come to light when significant amounts of fructose is ingested. This may happen in early life since baby milk formula contains sugar (sucrose) which is a combination of glucose and fructose. The baby may exhibit symptoms of hereditary fructose intolerance which is sometimes misdiagnosed or at other times it is barely detectable which is complicated by the fact that the baby cannot report mild symptoms. Here it is sometimes mistaken for other conditions. It may remain undiagnosed for periods of time until the child gets older and can report symptoms, the signs of HFI become more obvious or children start rejecting foods with large amounts of fructose or sucrose (sugar). The condition is largely silent with small amounts of fructose ingestion. Unlike fructose malabsorption, there is little or no gastrointestinal symptoms like bloating and diarrhea. This is due to the problem lying with fructose breakdown once it is is absorbed into the body whereas fructose malabsorption is a problem within the gut. Lethargy and irritability – babies may exhibit excessive sleepiness and be inconsolable. These symptoms are more likely to arise a short while after ingesting a large quantity of foods or drinks containing fructose. The symptoms of hypoglycemia may also be present in hereditary fructose intolerance due to the problem with aldolase B impairing gluconeogenesis. There is no medical treatment for hereditary fructose intolerance. The key is to avoid foods high in fructose and often the patient can identify foods that make them feel “sick” although they may not be able to identify specific symptoms. Sucrose (sugar) usually needs to be removed from the diet as well since it is a combination of glucose and fructose. Dietary changes have been outlined in nutrition guide for fructose malabsorption.